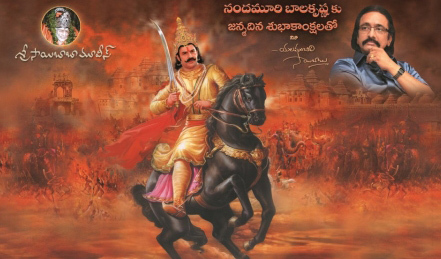 This is the poster released by Sri Rama Rajyam producer Yalamanchili Sai Babu on the occasion of Nandamuri Balakrishna’s Birthday. Balakrishna is seen in the get up of Vikramarka in the above poster. There was a rumour from long long time that Sai Babu is going to produce Nandamuri Balakrishna as King Vikramarka in the remake of Bhatti-Vikramarka. Bhatti Vikramarka is a 1960 film directed by Jampana Chandrasekhara Rao and produced by Polisetty Veera Venkata Satyanarayana Murthy, starring NTR and Kantha Rao. It is a commercial hit film ran for 100-days. Every one should appreciate Balakrishna and Sai Babu in their endeavour to bring our history and heritage to coming generations. The story is based on the historical characters of Bhatti and Vikramarka. Lord Indra invites Vikramarka to Heaven and requests him to decide who is the best dancer between Rambha and Urvasi. Vikramarka gives two garlands to them to wear and dance. The garland worn by Urvasi stays fresh, whereas that one worn by Rambha withers. He judges Urvasi as the best dancer, as she is fearless about her performance and win. As a token of gratitude, Indra gifts him a Simhasanam with 32 Salabhanjikas. Prachandudu performs 99 yagnas and in search of 100th yagna to achieve some magical powers. Mantrikudu tells him to invite Vikramarka for the sacrifice. He agrees and reaches the Smasanavatika, where he tells Vikramarka to get Vetala, who is hanging from a tree. He cuts the rope and getting Vetala on his shoulder back. While his return he narrates a tricky social problem and asks Vikramarka to answer. After successfully answering all the stories, Vetala reveals the ill intention of Prachanda. Prachanda on his return asks Vikramarka to perform Sashtang Pranam. The cautious Vikramarka tells him as a king he does not know how to do it and requests him show how to do it. He kills Prachanda while he is on Pranam and gets the magical powers.